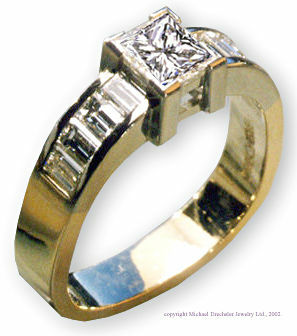 Our princess cut diamond & baguette diamond engagement ring was a special request. Elegant simplicity in 18 Karat yellow and white gold. Send us your special request. 18 Karat Yellow and White Gold, Hand Fabricated. 3D Design and proposal for this Diamond Ring. All content copyright � Michael Drechsler Jewelry Ltd.., 1996-2019. All rights reserved. 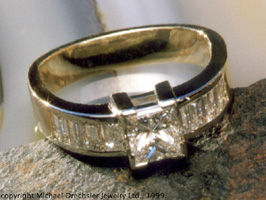 Reproduction or distribution for commercial use, or without the permission of or credit to Michael Drechsler Jewelry Ltd. is prohibited.